If one was ever to question their lifetime of unwavering devotion to New York City, February would the month to do it. It’s cold and has been for some time. It’s cold and will be for some time. And somewhere out in California, a “friend” — but really, are they if they torture you so? — is welcoming their first strawberries. You get strawberries in New York, too, but for about 5 minutes every June and they cost about as much per square foot as real estate in a neighborhood with multiple pour-over coffee outlets. So, yes, February is the month. But this February? I never thought it would be the one. This is, by every measurement known, the mildest winter we’ve ever had, and the shortest too. I am, by almost every measurement I can invent, the most loyal and content New Yorker you’ll meet (but not the shortest, although close). But every night for the last week, I’ve pestered my husband with talk of Los Angeles, a mythical place where it’s warm and sunny all year round, where the tacos are unparalleled, where the avocados are exceptional, where you apparently don’t need to be a millionaire to have a home with more than two bedrooms. This is probably what happens to even the most stalwart New Yorker after too long without a vacation. Fortunately, for times of great flux and inner turmoil, there are always cookbooks offering an escape. Like many a shivering East Coasters, I’ve been gazing lovingly over the Gjelina restaurant cookbook this week, an understandable side-effect of cookbooks photographed by Michael Graydon and Nikole Herriott. That cover! Maybe I don’t even want to move to LA, I want to move into that cover, a tucked-in nest of fiery squash, protecting you from the slab concrete. We should talk about the cooking too, and while it occasionally feels the tiniest bit formulaic, when that formula happens to be stunning gently charred vegetables, fish and meat, dabbed with something acidic (a yogurt sauce, bagna cauda, salsa verde and all of the other sauces I write across my heart), something rich (avocado, cheese, a bit of fruit), something fresh (herbs or another shaved vegetable) and something crunchy (seeds, nuts, crushed croutons, crispy onions, hiii ily), it is clearly in the service of greatness. I feel a responsibility to warn the home cook that sub-recipes abound (ocean trout rillettes has four; there are three within the rye rags with sausage, mushrooms and fennel that I’m going to make anyway because you read that title, didn’t you?) but there’s so much else in here for us — an enviable pizza section, a chickpea stew with tomato and turmeric I would swan dive into if I could — it would be a disservice to us to let this keep us away. The 30-deep vegetable section alone is worth the cover price; there isn’t a thing in there I don’t want to eat for the rest of my life. Because I’m back in the kind of place where I roast sweet potatoes all of the time for children tiny and mid-sized, I was drawn to the yams first. They’re roasted in long wedges with a bit of honey, olive oil and a tremendous amount of pepper flakes (adjust to taste, of course) until singed and steak-like then drizzled with a sharp lime yogurt and thinly sliced scallions. For my purposes, I felt like I needed to add one more thing to make this more of a dinner centerpiece and that thing was chickpeas, roasted until crisp with smoked paprika and salt. My husband and I will unapologetically admit that we usually only eat sweet potatoes begrudgingly; they’re fine, but we mostly keep them around for the kids. Not this time. We didn’t even offer to share, just decimated the dish after they went to bed; my sole regret is having not doubled it so I’d have more left for today’s lunch. You’re going to end up with more yogurt and more chickpeas than you probably need — or fewer potatoes. It’s all a matter of perspective, really. Line two baking sheets with foil, for minimal mess. Coat one, the one you’ll use for the yams, with 1 tablespoon olive oil. 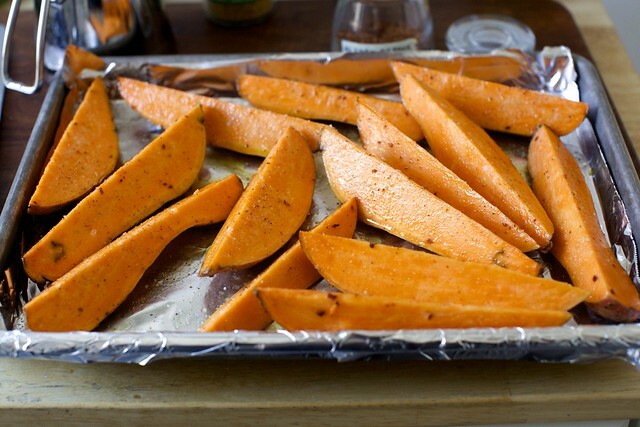 Toss yams with honey, 1 tablespoon olive oil and 1/2 tablespoon of pepper flakes. Let sit in bowl for 5 to 10 minutes. 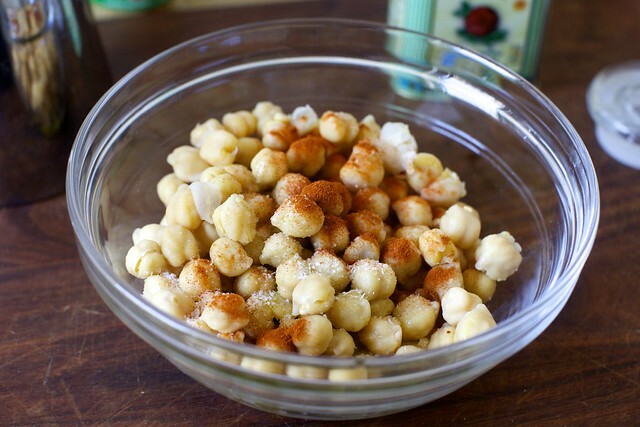 Toss chickpeas with 1 tablespoon olive oil, smoked paprika and salt, to taste. Spread yams out on olive oil-ed baking sheet in one layer. Season with salt and pepper. Roast for 30 minutes, until nicely toasted underneath. Flip/move wedges around and roast for 5 to 10 more minutes, until soft and singed. For extra color, run them under the broiler for a final minute. Meanwhile, spread chickpeas on second uncoated baking sheet. Roast in oven for 20 minutes, rolling around once or twice so that they cook evenly, until lightly browned and crispy on the outside. Set aside. Whisk yogurt, remaining tablespoon olive oil and lime juice together in a small dish, then season with salt and pepper to taste. Arrange yams on plate or platter, drizzle some of the yogurt over, then about half the chickpeas. Garnish with scallions and remaining pepper flakes, plus flaky sea salt, if you have any. Keep extra chickpeas and yogurt on the side. Dig in. Looks delicious. I love anything with yams (which I think may be really called sweet potatoes!). Molly — I’m allergic to honey, so I’ve several substitutions that I alternate depending on the use/recipe: golden syrup, maple syrup, brown rice syrup, molasses, corn syrup, etc. That should be *mild* Aleppo, I assume ;) ? But arrgh. Your posts always through my carefully laid out meal plans in disarray….everything just screams MAKE. ME. NOOOOOW. Creamy Greek yogurt? Allons-y, Alonzo! Seriously, these are a whole bunch of my faves in one dish. I’m pinning this one! Looks great! But sadly, you’d be wrong, Deb, about the not needing to be a millionaire thing… there are some parts of LA and its environs where you can get away with it, but for the most part, SoCal is pretty horrendously expensive. I, for one, don’t care what you call them…This looks delicious and I’m trying it tonight! This looks so rich and inviting — perfect for colder weather! Quick question: I’ve never had unpeeled yams before, now that I think about it. How do the skins do when roasting? Ah! This looks and sounds heavenly!! Totally my and of dish! I will def. prep this tomorrow for lunch! I’m so confused, because this is pinging all my usual chili-cheese-fries-want-now-please receptors, and yet, it also looks so light and pleasure-inducing… it’s like magic. If this is representative, I’ll definitely be checking out the Gjelina cookbook! These sweet potatoes look incredible! My current work lunch goto is a bowl of roasted sweet potatoes plus roasted cauliflower plus rinsed/drained chickpeas (or black beans or black-eyed peas). Like you — I don’t peel the sweet potatoes — it’s just extra texture and fiber. I mix up the seasonings and mix up the beans to keep it from getting monotonous. This looks amazing, Deb. So … do you not peel the yams? Do you peel the yams/sweet potatoes before roasting them? After setting the oven on fire a few weeks ago due to my own winter sweet potato roasting craze, I’d suggest considering a shallow roasting/baking dish — anything with a lip! Those of us with gas stoves have to be careful of the dangerous — albeit delicious! — caramelized drippings that sweet potatoes produce, especially when combined with oil and honey. Peeling — I did not peel, I never peel. I do scrub first, though. Honestly, it’s easier to keep them intact with the skin on. Oh Deb. I’m with Linda – My meal plans keep getting derailed by Smitten Kitchen Facebook updates! We ran to the store last night to make the Scallion Meatballs with Soy Ginger Glaze (mercy, were they good!) then ran to the store this morning to get more ingredients to make them again tonight (by unanimous family request). Now I’m trying to figure out how long the produce for other planned meals will last if I make these potatoes tomorrow night… It is the very best kind of curse. Keep up the amazing work! Would it make you feel better if this southern Californian told you that I am intensely envious of your seasonal weather? We don’t get nearly enough rain in this beautiful, parched land of sun and surf. Thanks for the recipe! I think I’m going to make these this week. Rumor has it that water may fall out of the sky here later this week, and this recipe will be perfect wet weather dinner. Love that you too are obsessing over the Gjelina cookbook. Every recipe in the book is well-tested and sublime. Today, I published another apologetic post from their cookbook because I cannot get enough and then made many comments about the recipes posing as ingredients, sometimes three layers deep. To read your post after, was gratifying and I love your take on this dish. We moved from NY to LA and get to eat here everyday and now Butcher’s Daughter. Wish you were here too. It’s true, we’ve started getting Santa Cruz County strawberries here in San Francisco. They’re still pretty pale at the center–I think it’s a matter of how many hours of sunshine they get every day–and they need a sprinkling of sugar, but they’re good all the same and a harbinger of more and better ones to come. The early arrival is probably a climate change thing, and the hours of sunshine are instead of what we need, which is rain, so the good news comes at a price, but the berries are hard to resist. That sounds like a winning formula for fantastic meals. I’m going to have to check out Gjelina and try these yams. I do want to cook more with sweet potatoes, and you just gave me a wonderful reason to do so. Thanks for sharing this awesome recipe! Hooray for the pink cowboy!! :-D Thanks for sharing the pictures! This recipe unites a lot of favorites… I’ll try that soon. Oh, and I had the moules marinieres last weekend – ooh la la. Wonderful. New Zealand is even more confusing with the potato like vegetables that happen to be sweet. Kumera is an sweet potato, but yams are actually a completely different less starchy tiny tuber thing. Facebook is informing me it’s the first day of fall (noooooo!) so these will be on rotation shortly. This sounds so delicious. We are big yam fans. However, even though it has protein covered, thanks to the chick peas (my favorite! ), the Carnivore will insist on a portion of barely cooked large animal to go with it. I love your informative yet stream-of-conscious style…. I agree with Nikki above. I miss the seasons for sure, especially September and October when it is in the upper 90’s here and everyone else in the midwest and east are making fall soup and wearing sweaters and boots and walking through beautiful leaves. Strawberries, are indeed, amazing here, but the traffic…not so much. Thanks for your beautiful writing, photography, and recipes! Have a great week! What a great veg meal. Looking forward to trying! Hi Deb, if using dry chickpeas, what quantity would you use? Also – is there a counter indication to soaking chickpeas and then roasting them as indicated by the recipe? Or should I cook them first, then roast? Thanks very much. Oh yes, oh yes! This sounds wonderful. Adaptable, too, I should think. If you wanted, it seems like some crumbled feta or little bits of fried halloumi would give a tasty salty counterpoint to the sweet and tart. And Aleppo sounds like the perfect chili to include here. Thanks for this recipe! I think this would work with a lime vinegarette— juice of two limes and maybe a half cup of olive oil plus salt and pepper, and an optional teaspoon of mayo if you want it to stay emulsified. As I am from Australia I am not sure what you mean by crushed red pepper flakes – we don’t have them here – we do have chili flakes but 1 tablespoon seems and awful lot for someone who doesn’t like hot chili – the only other thing I can think of is we have red capsicum (which you may call peppers) but they are not available in flakes – please help!!! I’m so obsessed with sweet potatoes! I roast several in my oven a couple times a week, but haven’t done wedges in a while… the greek yogurt sauce sounds amazing! Came across this recipe on Facebook this afternoon and realized that I already had all of the ingredients, so I decided to make it for dinner alongside a creamy pasta dish. The flavors and textures pair perfectly with each other. The amount of heat was almost overwhelming, but tempered well with the lime yogurt. We will definitely be making this again. Thank you for the wonderful recipe! Diane #36: How about Coconut Yogurt? I believe it’s dairy free. You could also add a bit of tahinito the yogurt to make the flavor more savory. Good luck. don’t move to L.A. While the city would welcome you, you would hate it after a while. There is no soul there, just tons of cars and skinny people who eat air. Seriously? Those curls on her? Oh my. Angels alight. Oh my, oh my, oh my. Sublime. Yeah, this definitely falls into the category of “I normally have everything” and this was a delicious weeknight recipe! Thanks! This looks amazing. Writing from LA to add the weather is awesome the produce and farmer’s markets are unbelievable. Every time I go to the east coast the markets horrify me (even in peak summer harvest time). However there is no buying a house unless you want to be the equivalent of bridge and tunnel. Well at least not for me cause I want to live by the beach! Carol #36: Capsicum in Australia is what we call Bell Pepper, so no, not the same. Red pepper flakes are spicy, often sprinkled on pizza. And a tablespoon does seem like a lot. The dish would still be good without it, I think. Made this for dinner tonight and found it a tad sweet for my liking (to be expected; they are yams, after all). I topped mine with capers, and the added briny saltiness pulled it together for me. I have been following you for many years now, always just fab recipes!! I agree with Erin, Julie, and others you do need lots of money to live comfortably in Southern California! And, if not, you will have to live further out and the traffic will kill you…absolutely kill you! I’m from Philadelphia and I’d never seen such horrible traffic until I moved to southern California 8 years ago—12 lanes…all inching forward for hours. And, unfortunately, getting to any of the great stuff–restaurants, markets, stores–takes a whole day. it’s absurd. Blue skies and sun always…is not worth the inconvenience. Plus, the native Californians…incredibly superficial. No one reads books here or talks politics….it’s all about money, cars, looks! So, unlike the East Coast!! Thanks for your incredible website and all your work!!!! Just love it! I will not buy another cookbook, I do not need one more, no no no no no! But this recipe sounds and looks fabulous, and your description of the book makes me think I would be drooling over everything in it too. On another note, did you mean to repeat “It’s cold and has been for some time. It’s cold and will be for some time” like that? This looks fabulous! And healthy. If you’re looking to escape — South Florida is closer and hotter than LA! Let me know and I can make some recommendations! This is my dream meal. I will make it. Thank you. Lol, your story about your friend in California with the strawberries – as a former East Coaster, and a SoCal transplant, I know exactly what you are talking about!! We have just started getting strawberries the past few weeks – it still amazes me how much fruit we get year-round! Very cute kiddie pic! Being Canadian, I am not privy to either Californian sun or the obvious benefits of living in New York! Do know I would miss, like crazy, the seasons… And, sorry to say, I love the colder months, would not be a huge fan of heat, heat, humidity and more heat… Love my wood stove … But also getting out in the winter air to do stuff outside too. Your sweet potato dish looks scrumptious and I will have to attempt roasting sweet potatoes once again, as my one and only previous attempt did not go well…. Gjelina, a composite of recipes from the outstanding and trendy restaurant in Venice CA. Except you add chickpeas… good idea. But I think if recipes are ‘pinched’ from another cookbook, proper acknowledgement should be given. Lucy, #55, if you look right under the title where the recipe is, it says “adapted from Gjelina”. Barbara — You can skip the pepper. Starting from dried chickpeas — I find that 1/4 pound dried yields about what 1 15-ounce can will. I often find that chickpeas that have been cooked from dried roast more quickly in the oven because they’re more “al dente” and less water-sogged to begin with, so start checking in at 10 minutes to be safe. Lucy — This recipe isn’t “pinched.” Most of the article above talks about the cookbook and the recipe, right below the title, is credited to it. Credit is always given to sources on Smitten Kitchen, without exception. A few more notes that I didn’t get into because this post was so long I didn’t get into it — I found that the roasting method in the book was not as easy as it could have been, and have heard from people who used 2T honey that it was really a sticky, even burned, mess. This is why I suggest you use “my” roasting method instead, which is to always start by coating your sheet with oil (I use half the oil they recommend tossing the wedges with). I also found that you’re not going to get the color you see in their photos in the time recommended, and you’ll have a lot more yogurt than you need. I don’t note these things to bash the recipe, but to make clear that when I say I’ve adapted a recipe, it means I’ve made changes that should make it work better for everyone. The only thing better than having the recipes from Gjelina is living within an easy drive of Gjelina. The food is fabulous, the vibe is hipster fun and the servers just lovely. Don’t make the recipes, Deb, just move here. Native So. Cals aren’t superficial at all (!? I’m one and I’m nice!) though real estate, in the more desirable areas, requires more than a few sheckles. That said, sun and avocadoes are worth every darn penny! You and your family are welcome here! The fresh produce at Santa Monica Farmer’s awaits you! Sweet potatoes, a member of the morning glory family, are widely grown in the USA and that is what you’ve roasted so deliciously; they are available in most supermarkets. Yams, a completely different plant (dry starchy tuber, less flavour) can be grown only in tropical countries, above all in Africa. Look for them in ethnic markets. Don’t confuse them. Recipe looks delish – and consider Florida! Lots of sunshine, reasonable cost of living, no state income tax … I don’t live anywhere near the Plant City strawberry area of FL but my mom just called to tell me that our local grocery has the Plant City strawberries in @ 98 cents per quart. I’m pretty sure that means I need to get busy making strawberry preserves! outside Boston, daughter in LA. Every time I visit her we go to Gjelina! Thank you for continuing to post great vegetarian recipes! I’ve only been vegetarian for 2 years, but it hasn’t been so hard because I can still cook from my favorite blog. I make a similar recipe and I put cheddar on top of the sweet potatoes which is delicious possibly though it might be overkill with chickpeas AND cheddar..or maybe it will be wonderful. I will try it and report back since those paprika covered chickpeas sound great. Also, I trust you! Jacob and Anna are just..I don’t know how you handle the cuteness! Made this last night for dinner, and it was great! Thanks! I’m sending my husband on an urgent yam procurement mission (we only have 2 in the pantry). The beauty of this recipe (to me) is that every other ingredient is in good supply (for us, they are common pantry staples)! I’m in hearty agreement with the others- MUST EAT THIS NOW!!! Thank you! I made this last night and it was a huge hit. I served it garnished with cilantro and alongside quesadillas (pan cooked in olive oil). Everyone raved! Thank you! Skip LA and come to San Diego! Less traffic, lower cost, more beach and dare I say better Mexican food (by proximity, of course). The kids could even come for the best zoo in the world! Just saying, no one paid me to. Now food talk…I love your cookbook recipe for juevos rancheros (ranch style eggs). BUT I must add a new challenge to your world- juevos divorciados. Why, you ask? This place my wife and I went to eat (LTH Oceanside) made their juevos rancheros in this mash-up like divorciados…so the tortilla is baked whole, spread with refried beans, the eggs, sauce, and some greens, but it is also stacked on top of another sauce and some sugar glazed bacon and avocado. Agh, it was so good. Please consider this dish in your pursuit of the ideal meal and the making of a new cookbook. Please please please. I made this for dinner tonight and it was delicious! I also cooked a pork loin to satisfy my meat eaters and the flavors all went together perfectly! Deb – thank you so very much for having the most wonderful blog! I love your recipes and I love the way you write! Jesus. There is soul and culture in LA. People in LA read books. The LA hate is as ugly as the drive from JFK to the midtown tunnel! Someday this native Californian will make it back to the west coast and its beautiful produce but in the meantime, there are February dinners of tubers and beans. Sigh. I love when the components of a recipe are flexible enough to work for both kids and adults, depending on “the smalls” phases and stages of pickiness. Brilliant! I made this tonight for dinner for two hungry adults, a preschooler and a toddler – it was delicious but wasn’t quite enough, even though I had added an extra sweet potato (fortunately we had a lovely dessert waiting)! Since I didn’t want either of my littles chomping down on a crushed red pepper flake, I used a small sprinkle of cayenne pepper for heat. I know It’s divisive, but instead of sliced green onion, I used chopped cilantro since we’re into that sort of thing. Maybe next time I’ll sneak some cumin in somewhere too? This was a keeper! I made this tonight for dinner and like Jenna above used cayenne pepper which worked great. I cooked the chickpeas for 20 minutes and should have left them in for another 5-10 minutes. I did have a bit of an issue with distribution of the honey. It ended up clumped up on some wedges and none on others. Next time I will heat up the honey first so it spreads better. Otherwise this was a great meatless dish. We only eat meat 1-2 times a week so I am always on the lookout for creative vegetarian meals. I will make this one again. I made this for dinner tonight and it was wonderful. I had just cooked up a lot of black beans so I used them instead of the chickpeas.They were delicious. My daughter commented on how much she liked the sweetness of the honey against the spice of the chili. I added a little chipotle powder to mine as well. I will def make this again. This would also be lovely as a side to roast chicken or pork. Diane #36: I am seriously considering trying this one without the yogurt. Just not having any sauce at all. If it seems to need something mild alongside the heat, I’d consider a touch of good mayo. (I like mayo with those thick belgian fried potatoes.) The combination of chickpea + tahini always feels like hummus to me, and that doesn’t seem to fit here. I had only one lime instead of the required two. I put too much salt on the chickpeas. My pepper mill disintegrated in my hands and dumped a load of pepper on the sweet potatoes which I couldn’t remove (at least not entirely). And it was absolutely delicious. Definitely a keeper! this looks SO delicious, perfect for cold days, right? Definitely roasting vegetables brings out the best flavor in them. I must say I have never tried with yams but often with pumpkin. You get such a sweet delicious flavor when you roast it. This is perfect with yogurt and chickpeas. You have made a good veg and nutritious meal! I love your website. Everything I have made from it seems to turn out without too much trouble. Thank you for what you do! Looking forward to trying this recipe. Deb – you have changed my life! I am now cooking all from scratch and am such a better and happier cook. Thank you. I absolutely love your website and cook so many recipes from it! Regarding sweet potatoes – I live in NC. In the fall, I took a cooking class from April McGreger and purchased her book entitled Sweet Potatoes, published by UNC press. It is an excellent book with several recipes that are on our regular rotation – it is also very educational re: sweet potatoes vs. yams. Best wishes and love from NC! Delish. This has such an Ottolenghi feel to it. Amazing, as usual. I accidentally made it with chilli flakes instead of pepper flakes and didn’t regret it. the lime yoghurt is life changing. Thank you! Just made this for lunch. Incredible how so few ingredients could produce such an amazing meal. My only regret is that the hubby was also working from home today and ate what was meant to be my leftovers. We made this last night for supper and really enjoyed it. Thanks for the recipe! Hey Deb! Love the idea of this recipe. As soon as I can have carbs again, I am making this. I used two pounds of potato to the tin of chickpeas and the ratio was about right – I mixed all the chickpeas in. I also put a bit of cumin on the chickpeas as suggested above. And I roasted a couple of unpeeled garlic cloves with the chickpeas and squeezed those into the yoghurt dressing. Will definitely do this again. And Deb thanks for all your commitment and creativity in keeping the site updated so frequently! I really look forward to your latest recipe after a difficult day. Hello, first off I would like to say that this recipe looks delicious and flavorful. I am a huge fan of yogurt and especially sweet potatoes so this a wonderful dish for everyone to enjoy. I was wondering, can you eat this dish for breakfast? Or is it strictly a dinner or lunch recipe? I will definitely be enjoying this with my family and thank you for sharing such a good recipe. Thank you for this recipe. I am about to serve it in a few minutes. Just a few observations. I did coat the tin foil with oil and the potatoes have still burned due to the amount of honey. Next time I will keep a better eye on them and not cook as long. Looking forward to eating in a few minutes though as the rest of it is all good. If the yams are kept separate, will this dish reheat well for the next day? Bob — Yes, but the chickpeas don’t keep their crisp very well. Made this last night, but altered. Instead of listed spices, we used cumin and chili powder, then salsa verde instead of yogurt. No honey, didn’t miss it. It was absolutely incredibly delicious, and easy. The salsa substituted for the acidity of the yogurt. It was also extremely filling despite the lack of grains, which is usually a staple for dinner. We were so lucky to have had the best meal of our lives at Gjelina back in Dec. with our newly-relocated son and daughter-in-law. I’ve been raving about that meal ever since, and I’m so excited about the cookbook! And can’t wait to get back out to visit them and do it again! I live and work quite close to Gjelina(and eat there a little too frequently), and I have to disillusion you. You must be a multimillionaire to buy a home anywhere near here. I can’t even find a reasonable two bedroom to rent unless I want my commute to go from a 10 minute bike ride to a 45 minute drive. The rents even make me miss Brooklyn. Northridge is cheap, however! My phone keeps thinking I want to live up there (I don’t) and showing me 4 bedroom houses with pools for like $800k. I made this for lunch yesterday, and it was fantastic! Thank you for a delicious recipe. Derek — “Divorced Eggs.” I kind of love it. :) Also I realize this is what a taco place basically makes and calls Huevos Rancheros. Anyway: on it! Deb – I made this recipe with yams, and roasted them for about only 20 minutes. When I pulled them out to check they were already SOOO mushy and just fell apart. Is there a trick to getting them roasty and crisp on the outside and soft on the inside? Still tasted great! Yum! This was really fast — about an hour total. I used regular yogurt. I don’t think the chickpeas got quite crispy, and the sweet potatoes weren’t as done as your pics, but it was still very tasty. For anyone thinking of packing this for lunch, my chickpeas didn’t seem to keep very long (not even a few hours). Glad to know comments are the place to post recipe suggestions. I know I wanted to recommend socca (a la Mark Bittman in _How to Cook Everything Fast_). When I remember my other suggestion I’ll add it. I had a butternut squash on hand that I’d been meaning to make soup with but didn’t, so I subbed it for the sweet potatoes, which i didn’t have. It was absolutely delicious. I would definitely make this again. 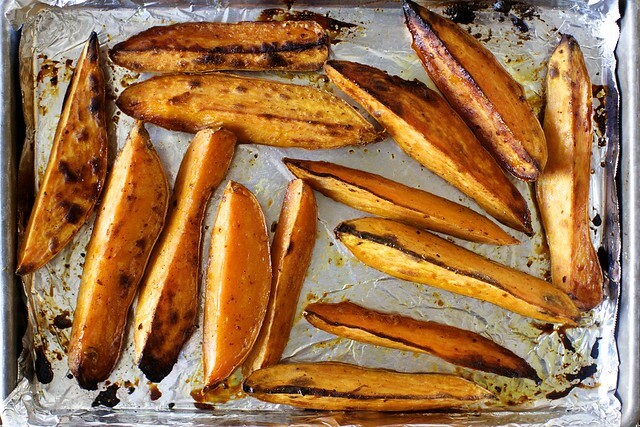 Laura – I’ve found that when cooking sweet potatoes/yams you need to roast them past that point. They will initially get soft as you’ve described, but if you continue to cook them, moisture will cook out and they will firm up for you, and get that slightly hardened exterior. Deb, this looks so delicious. I cannot wait to try it, and I need to check out that cook book. You have provided my repertoire with some of the most interesting and textured vegetarian dishes I have ever had! Thank you!! Some related thoughts to the comments above… re: lactose intolerance, that used to be me. I could not finish a small bowl of cereal without having an emergency. Then my sister, a bio teacher, told me to get on the non-sweet yogurt bandwagon. The friendly bacteria definitely helped me to digest milk products. I can eat any dairy now, though there may be other factors involved. I don’t really like the supermarket Greek yogurt, but Bulgarian seems to be rising in popularity and worth a try. My favorite yogurt is from Karoun Dairies out in Cali. Almost scoop-able and so good! For sweet potatoes, I like to roast/grill wedges with olive oil, coarse kosher salt, black pepper, cayenne, rosemary, and Aleppo pepper. I like to dip that combo in a seriously zippy sauce of mayo, sriracha and lime. Soft sweetness, on-fire spiciness, and electrifying zing. Appreciation for that kind of contrast is something I learned from Smitten Kitchen. :) Thanks Deb! I hate it when I try to point out something that appears to me to be an editing error, which in fact I simply misread the text. Sorry! I will take my pedantic ways home now. Long time reader, first time commenter… This recipe was amazing. My tastebuds are still dancing from the fantastic dinner last night. I love so many of your recipes, but this one is life-changing. What a wonderful recipe! 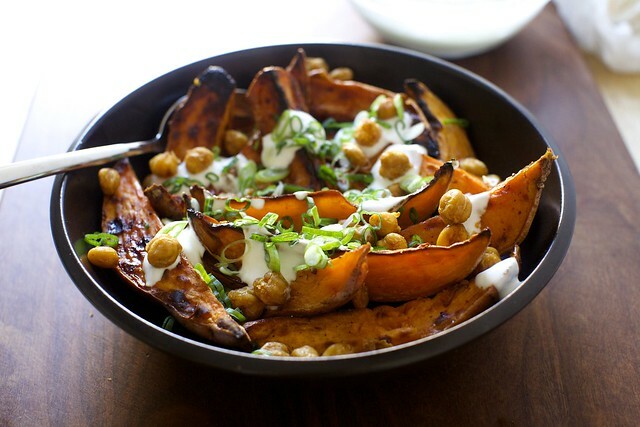 It was easy to put together, the sweet potatoes caramelized perfectly, the chickpeas helped turn this into a hearty meal, and the yogurt sauce added an incredible tang that prompted me to keep adding more dollops to my bowl. During a week in which I brought home 10 sweet potatoes on Monday just because they have recently become my favorite food, this recipe was well-timed–Thanks! This looks absolutely amazing, I will be making this this weekend for sure. I love sweet potatoes! I would like to thank you for a perfect vegetarian meal, also very easy. It’s important to have wonderful tasting food that doesn’t take a lot out of you to make. I left out the honey and put in sriracha instead of the pepper flakes, too spicy for me. This dish looks as good as it tastes! Would be good meal for last minute company. Thanks again. My husband and I are red-pepper-flake wimps. So I used plain chili powder and a bit of cinnamon, and the barest hint of a sprinkle of ground red pepper. Warm and sweet and cool and tart; aren’t those the four perfect taste senses food goes for? This is going in the rotation. SO tasty! Super easy. Hard to stop eating it. And each element–the scallions, the crispy chickpeas, and especially the sauce– really adds to the whole. I made this for my mom and I last night and we both loved it! Perfect balance of sweet and tart! Although next time I might just use (unroasted) black beans rather than the chickpeas. Thank you for sharing !! Oh my goodness, this is the best thing I’ve eaten in a long time. Wasn’t planning on making dinner tonight but couldn’t get this out of my mind. So easy to pull together. So inexpensive. And so, so delicious. Layers of flavor. I’ll be making this again very soon. Maybe tomorrow. Because it is that good. Thank you, Deb! This was a hit with my whole family – vegetarian husband, 13 yr old step-son and me (of course). My husband was skeptical and kept pushing me off when I tried to suggest. Now he’s a convert. We will make again and again. But I guess it doesn’t matter; when combined with chickpeas and yoghurt, all of them will be delicious! Made this yesterday for lunch — SO DELICIOUS!!! My meat eating husband was skeptical at first but couldn’t stop commenting about the layers of flavor and texture and how it was perfect with his IPA beer. Just emailed the recipe to my vegetarian brother to try. Will definitely be making this again! I never peel my potatoes either. More vitamins in the skin (or, is that an old wives tale?) 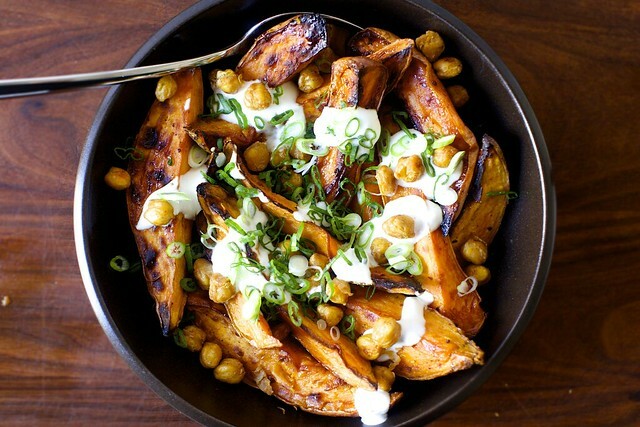 I am making this for dinner and the sweet potatoes are roasting in the oven as I type this. I can’t wait to eat later! Also, I often make roasted chickpeas for a snack. They are delicious and should probably be kept away from me, or else I’ll eat an entire can. Whoops! This was good. I had it as suggested, my husband topped his with harissa. Pretty yummy. This looks like the perfect side dish, lunch dish and a great one to bring to a friends house. Love the yogurt – and the gutsy 1 Tablespoon of red pepper flakes. Bring it! I always find your instructions so easy to follow and you include a lot of detail that most other bloggers (and recipe books!) don’t. But one thing I have always questioned is cooking times for roasting vegetables. Mine always take almost twice as long as most recipes (including yours) indicate. Reading this I thought – 40 min total for fairly large sweet potato slices? Even when I make thin sweet potato fries in the oven, they need almost a full hour total at 425 to get nice and crisp on the outside – i.e. to look as cooked as yours do in your photos. I find this with many other roasted vegetables, with most recipes, and with a variety of different ovens I’ve cooked with over the years. My veggies are never done nicely when I only cook them for the time the recipe says. Is everybody else’s oven hotter than the ones I have cooked with? Or am I doing something wrong – is it possible that putting too much/too little oil or salt is doing this consistently? In any case, as I usually do, I’d at least 20 min cooking time onto yours to get the same crispness. Kris — I’m surprise it takes so long. I have roasted sweet potatoes (cut, not whole, which of course would take longer) probably almost once every two weeks for 3+ years now (seriously, my kids love them) and it’s always 30 minutes on the first side, 10 on the second. This is a rare thing where I feel almost unnaturally confident about the cooking time. Regardless, if it takes longer in your oven, just give it the time it needs. Re, crispness: these get a nice little char and a bit of texture to them, but I wouldn’t say sweet potatoes really get very crisp, or not for long. Hanna yams have white flesh – for those of us who live with ‘orange-flesh hater’. Am going to try this with hanna yams. Made a double recipe–had to substitute sour cream for yogurt (three trips to get ingredients and I had vanilla yogurt!) NO leftovers. I could eat this every day. This is a wonderful recipe! I made this for our dinner last night and my husband and I loved it! I added some tahini to the yogurt for a nutty kick – highly recommended. Thanks for sharing. Kris – sounds like it may well be your oven running low. Have you tested its temperature with an oven thermometer? Also, try putting the veg up high in the oven. And do you preheat it? I made this last night and it was DELICIOUS! Only change I made was to add shelled pumpkin seeds instead of scallions. I’m a vegetarian, so always looking to add additional nutrients. :) I didn’t have much of an issue with soggy yams, but maybe it’s be as I have a gas stove? Anyway, reheated leftovers for lunch today! Will definitely be making again. This was way better than I even expected! I will definitely make this repeatedly. Next time I’ll use less red pepper flakes. Oh and I doubled the amount of chickpeas and yogurt and I Was glad I did. This looks delish! I want to make this for a company dinner. What would you suggest from your other great meal recipes to make this with? Thanks. Sandra — Do you want to serve it with meat or should it remain a vegetarian meal? 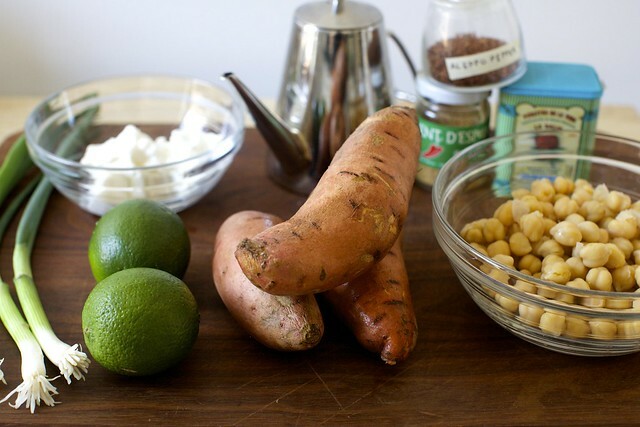 I really loved the flavor profiles of this – I cut the sweet potato much smaller, due to my preference, sort of like thin fries, and then just dumped them into the dish I used to roast the chickpeas and served the whole thing in that. I also just combined everything together at once (no chickpeas or yogurt on the side). I made this with a cucumber and feta salad I also found from Smitten Kitchen, although I can’t find the link now! I was looking at reviews of that restaurant and cookbook just about a week ago. Among the criticism of the book was the amount of charring on the vegetables, so when I try this recipe, I don’t think I’ll be finishing it with the broiler. This looks wonderful (except for my non-sweet potato eating husband). I do think it would be a great offering for our weekly group dinner–the others can treat this as a side dish to meat on the grill! To Derek (#72) (sorry–this is the only way I know to communicate): LTH looks wonderful! Definitely going to visit! (Even though they’re not showing huevos divorciados on their menu right now). Have you tried Wrench and Rodent? I’d like to serve this with a meat. This was truly enjoyed for the past two nights! We only had two yams and the proportions were perfect– we served it with grilled skinless boneless chicken breast, and a light spinach salad would have been a good addition. This was the first thing I’ve made in our oven since moving in, and baked both chickpeas and sweet potatoes at 350– only realizing my mistake after they came out, UGH– and they were still fantastic. Added to the rotation! A perfectly easy and soul-satisfying dish. Thanks Deb for a recipe that satisfied all of us including the vegan teenager. For him I made peanut butter sauce with lime juice and hot water and I subbed cumin for the smoked paprika because I cannot abide smoked paprika. Delicious, easy and vegan! Since the teenager decided on this course I’ve learnt such a lot. Thanks again. Delightful, but the red pepper flakes can be a little much unless you really like heat. Everything roasted up beautifully, though, and I’m definitely making this again. I’ve had this on the brain since seeing it when it was originally posted… finally tried it last night, kind of. I realized I didn’t have any honey (what?! what is this house and who let us go so long without honey) so I modified and made a glaze with maple syrup (the real stuff), sriracha, and EVOO. Then I realized I didn’t have any limes, so the yogurt sauce ended up being yogurt, a bit of EVOO, a clove of garlic mushed to a paste, and a couple tablespoons of cilantro. …basically I totally failed at making this recipe, but it inspired one of the best things to come out of my kitchen in a long time, so I’ve come to post and THANK YOU for that :) Looking forward to making this for real as soon as I get some honey! Just made this… totally delicious! I followed your instructions (as always), but why let the sweet potatoes sit with the oil and honey on them before roasting? Does magical something happen in that 5-10 minutes? Loved this esp the yoghurt sauce – I only had lemons and it was still delicious. I served it with Lamb Ribs. The best thing is that there are leftovers for lunch!! SO yummy! I discovered that one of my limes went moldy so I used one lime and half a lemon and it tasted great. I have to disagree about having too many chickpeas – I snuck a few while waiting for the potatoes to cool a bit and wished there were more! I might roast just the chickpeas as a snack in the future. That looks an awful lot like an Ottolenghi recipe from Plenty that I love. Who knew lime and sweet potato worked so well together! He also adds lemongrass. Made this last night, was so good!! Thank you for sharing a fun and tasty recipe! I just made it for my family for the third time. I tried adding a clove of minced garlic and a smidge of minced fresh ginger to the yogurt sauce and it was great. I also tried adding halved hard boiled eggs on one occasion and roasted tofu to the chickpeas and sweet potatoes on another along with steamed green veggies and put all of the above over rice. This worked really well for the hungrier people in the household, especially with extra sauce. I do a similar variation. Serve with roasted broccoli and over couscous, quinoa or whatever grain I have. Similar to Deb’s miso, sweet potato and broccoli bowl (https://smittenkitchen.com/2013/10/miso-sweet-potato-and-broccoli-bowl/) but with a different flavor profile. I also have started adding the honey into the dressing instead of roasting it with the sweet potatoes; less burnt mess and the dressing is a tad sweeter, but you still can taste both honey and lime. Thanks for another great SK vegetarian entree! I had it over polenta and ate 2/3 of it myself for dinner. Will try some of the modifications posted by others like putting it on top of greens and using squash instead of sweet papas. Made these last night – absolutely delish!! “nuanced” is what i would use to describe the end product – sweet, spicy, crispy, fresh – just wonderful! The sweet potatoes and chickpeas are roasting as I write this. It’s already a favourite – this is the third time I’ve made it since you published it. I have a huge cookbook collection that is largely gathering dust at this point. Odds are high that any new dish I try is likely to be yours. When my husband asks what I’m cooking his next question is ” Is it a Deb recipe?” When I confirm that, indeed, it is a Deb recipe, his smile says it all. I do believe he’s smitten. Delicious!!! Made this for dinner tonight. Topped with few strips of fried halloumi. To use up the leftover yogurt sauce, might make your baked chickpeas with pita chips tomorrow – think they would go well together. I made this last night and it was so great! The lime yogurt sauce was clutch-different and made it so good. I think I’d do this again as a baked potato (instead of wedges). Another wonderful dinner for our Smitten Kitchen Week. This dish is SO delicious. You were right, Deb. Doubling the recipe is a must. Thanks again. I didn’t think it was that great! Sorry. I do like a lot of your recipes…I must have had this one built up too much in my head or something. I know I’m the minority but just being honest. Made this for work lunch club–3 of us total switch off each week, but one is vegetarian. I substituted the yogurt for tzatzkiki I had on hand, and it was amazing. The sweet potatoes were much hotter than I could have stood with my delicate palate, but the sauce helped to temper the heat. Delicious and very good the day after with nuking the sweet potatoes and beans, then topping with sauce and green onions. I really love this recipe – I’ve definitely made it my own by making potatoes bite-size (I love everything bite-size) and mixing everything together in a giant bowl for serving. If I don’t have limes I use lemon juice, and it’s just as good. The flavor profile (yogurt, citrus, spiciness) in this dish is spot-on and delicious – really a winner. I made this for my husband and myself tonight as we are venturing into a mostly vegetarian diet. We were worried about not feeling as satisfied with no meat meals, but this one really put our fears to rest. The complexity and harmony of all the flavors and textures with the simplicity of the ingredients was really great. I am so full and happy! Thank you! This was absolutely delicious! I found the leftovers reheated well when I reheated the sweet potatoes in the microwave and separately toasted the chickpeas in the toaster oven. This was delicious. I had my doubts, but it was so worth turning on the oven in the summer for. We gobbled up the chickpeas, they’re a little addictive. I could see roasting some other veggies with it to make it more substantial. Thanks Deb! I made this last night for dinner and it was delicious! The recipe is so simple. I definitely bookmarked this recipe for future reference. Made this dish tonight. I like how the ingredients are simple to assemble and the taste is very fresh. I would definitely cut my wedges a bit bigger. It was my fault as I didn’t realize the wedges Deb had were chunkier than mine. Mine fell apart a bit because they were cut too small. Will definitely make this again though! I made this a second time, with “Oriental” purple-skinned, yellow-flesh sweet potatoes. It’s so fast, and just as good as I remembered. I recall having extra yogurt sauce the first time, but not this time (even though I only roasted 2 large sweet potatoes). Do you have a print option for your recipes-they look great! I made this for dinner tonight and it was delicious – even my husband, who isn’t a big fan of sweet potatoes, enjoyed it (and asked when we’re having it again!). Next time I might turn the oven temperature down just a little, as my sweet potatoes were right on the edge of burnt. Just made this. It was delicious! I was skeptical as I made this. Tasting the individual elements as they were ready wasn’t exciting but then when you eat it all together. BAM! Amazing! Made this last night and it was SO delicious! We increased the recipe size and served with rice and it made a great main dish for 3 people. Even my 6 year old loved it, and that’s never a given. Thanks for sharing this one!! This recipe is even better than I thought it would be. Going in the recipe box! This is fantastic – the sweet potatoes get roasted-crispy with the pepper and salt, the chickpeas are a revelation, and the dressing is tangy and perfect. Perfect dish for below zero temps outside! Everyone here liked this dish. And, it was easy to throw together with mostly pantry staples. Going on the repeat list. STOP IT with this recipe. It is SO delicious and filling. One tip would be to roast 2 cans of chickpeas because they are so tasty I ate almost half my first batch before the yams were done roasting. I’ve been eating this for lunch all week A+ reheating and the yogurt-lime sauce is perfection. Not quite an epic fail, but almost. Since we’re a mile high I often have to cook things longer, but after 40 minutes the sweet potatoes were soft with burn marks, so I took them out. Reading the comments I think I needed 10-15 more minutes to reach the proper roasted consistency. Also, after 20 minutes the chickpeas were not crunchy — put them back in for 5 more minutes and they got tough and hard to chew. I used parchment paper instead of foil — could that have been part of the problem? I forgot we hate smoked paprika — maybe cumin or regular paprika would have been better. Sweet potatoes were way too sweet with 1 T honey, even though I had 4 potatoes, possibly because I used only a small amount of red pepper flakes (kids don’t like hot). I like the idea of cutting the sweet potatoes into small pieces instead of the big chunks, might try that. Oh, and the sauce was too sour — 2 T from one lime would have been enough. Or maybe it was the wrong yogurt! I really wanted this to be a delicious new vegetarian recipe, but it didn’t work for us. Super yummy. The layer of flavors was fabulous. A keeper. Made this when you first posted the recipe … YUM!! My husband, who doesn’t usually like sweet potatoes/yams couldn’t get enough. Thanks for re-posting … can’t wait to make it this week!!!! DELICIOUS!!!! Wonderful recipes! Would you please provide a “Print” format? Oh, is this ever a bit of heaven!! A phenomenal combination of flavors. Can’t wait to make it again. Thank you, Deb! Could I replace the honey (with maple syrup or…?) since I’m serving to a baby? Thanks! ps – all your recipes are AMAZING. Thanks for that, too! I made this last night and I’m not sure what I did wrong. When I checked the sweet potatoes after 20 minutes, they were black and smoke was coming out of the oven! The honey had completely burned. I followed the directions exactly. Any idea on what went wrong? I tried scraping off the black parts and still ate the meal, which was delicious despite the mishap! Thank you! I’m sorry it gave you trouble. I did a word search for burned here and it sounds like it happened to one other person so perhaps it’s not just you. It’s definitely a high temperature and both honey and sweet potatoes are more liable to scorch than white potatoes without honey but it’s more likely just oven variability. I hope it works better next time and I’ll keep an eye out for anyone else having this problem. This was fantastic! Everything blended together perfectly, and we loved the yogurt sauce. I didn’t change much except I added extra spices to the yogurt and I doubled the sweet potatoes. This is delicious! Yum, yum, yummy! may need to adjust the heat next time I make it (which will be soon). Hopefully my vegetarian daughter (who doesn’t actually eat a lot of veggies) will love it too! And, sorry to say (or brag) but here is Australia, strawberries from Queensland are in plentiful supply and cheap! I made this for dinner a couple of days ago and all I can say is bloody hell this is GREAT!! Now, I’m not really a stickler for weights and measures in savory cooking, so I just shook a load of chilli flakes over the sweet potatoes, as well as drizzling honey and olive oil by eye, but that seemed to work well. Similar story with the smoked paprika/ chickpeas. I forgot to buy limes, so instead of that, I made a harissa yoghurt (teaspoon of harissa swirled into greek yoghurt), and dolloped this all over the top. I also fried off a bit of halloumi to add to it, which was a marvellous addition. On the second day (I had leftovers!) I added some cavolo nero sauteed with butter and black pepper- also a winner. All in all- great recipe, as is, slightly adapted, or used as a base. Hurrah! Made for – I think – the second time tonight. The yogurt thing tasted sour by itself but matched perfectly with the sweetness of the yams. The first time I made it, I thought I should double the chickpeas for next time. This was the next time and I forgot to do that… but I still think I should. Loved this. I had some homemade pomegranate molasses from some Ottolenghi recipe that I drizzled on, served it wth laffa bread, and it was really delish. Okay, so I came across this recipe and immediately made it for dinner and it is DELICIOUS! Spicy, sweet, salty, creamy, carmalized, crunchy….it satisfies all the needs. Thank you. I was inspired to make this after you posted it on instagram the other day. So delicious! I added some avocado just cuz it was ready to go. Thanks for the repost of this! I made this last night after seeing it on Insta…. it was DELICIOUS! Had a little crispy bacon on the side for those who wanted it. Thank you for the inspiration! The flavors in this are so delicious! I made mine vegan by using soaked, blended cashews instead of yogurt, and served it on a bed of black rice. Adding this to my long list of Smitten Kitchen favorites! I fixed this for dinner tonight. It was delicious. Now I am sitting at my kitchen table reading your Every Day cookbook page by page. Thank you for the inspiration. Oh…and I ordered the casserole pans you recommended in the Epicurious article for Thanksgiving. I will definitely by serving hot melted cheese this Thanksgiving! Would it be possible to get a suggested weight on the yams? The ones I find in stores run very large – like a pound each – and I don’t know if that’s right or if I should look for smaller ones. I’m making this for the second time tonight (because the flavor is DELICIOUS) and I cut the yams into sixteenths because I can’t imagine trying to eat an eighth, they wouldn’t fit in my bowls! But then I have a lot more yam than chickpeas. Any help would be appreciated. Thank you – LOVE your site, the new cookbook is beautiful! Yum! I was concerned that the honey on the sweet potatoes would be too much (I’m not a fan of sweet potato casserole with marshmallows on top) but with the yogurt dressing it was perfect. And I’m always a big fan of crunchy chickpeas so I needed no persuasion for those. SO delicious! However, next time I will skip the foil. I found it to make for a sticky mess. I’d much rather scrub an unlined baking sheet than loose the delicious browned crust on the sweet potatoes or have to pick bits of foil out of my teeth! This is a truly inspired, delectable way to eat sweet potatoes. Love you, Debbie, but we found the chickpeas superfluous and will omit them in the future. We used Aleppo pepper. Everything else, down to the baking time, was perfect. My process was to drain and dry the chickpeas, then season and oil and place in oven (450 F is 230 C here). I rolled them twice in the first 10 minutes and it was looking good. BUT luckily I was in the kitchen and able to rescue the chickpeas just as they started acting like popcorn and exploding. Bit messy! I can see that if those popping critters had reached the crispy stage they would have been even more delicious and the contrast of textures even more divine . So what did I do wrong. so strange I can’t get the actual recipe, it just keeps taking me to the comments. I know I saw the recipe this week because I bought all the ingredients but now it’s gone. One of my favorite things i’ve ever eaten! So good. Can’t wait to make again. Real estate prices in Los Angeles are still insane. Have you considered San Antonio? Only for the puffy tacos! Made this for dinner and it was delicious. Warmed up the leftovers the next night and was just as good. I didn’t have any limes, so I used lemon instead – just the right amount of tang to it!! I absolutely LOVED this recipe! I went with your suggestion, and only used 1 T honey –great call! It was a satisfying dinner and went together quickly. I made this with the called-for amount of pepper flakes and boy, was it spicy. Perhaps I used the wrong kind. Still edible, if a little uncomfortable. Maybe due to the spice levels, I think it went just as well with plain Greek yogurt in place of the yogurt sauce. Cold leftovers worked well as a lunch today. Been trying to eat more fiber and less cholesterol while still keeping husband from whining about lack of flavor. This fit the bill very well! My calorie counting app estimates this had about 750 calories 16g fiber and 22g protein in case that helps anyone. I prefer the sweet taters chopped into ~1 in cubes. It’s kind of awkward to cut wedges and I like the texture created by cubes. I make double the chickpeas. They’re good. So good! Having run out of honey, I’ve discovered that this works just fine with brown sugar, in case you were wondering. I add cumin, cayenne, chili powder, etc. to the chickpeas and they are better for it…yum. I like the yogurt sauce with a LOT MORE olive oil. I have no idea how much because it’s a add-a-bit, taste, add-a-bit-more type of deal. This is one of my favorite dinners to make! And it brought my onion-averse partner around to green onions, which is saying something. Very good! I threw this together for myself after a long workday, while my husband went to get himself a pizza. But when he tasted this dish he loved it! In case it helps anyone in the same situation, my store was out of regular sweet potatoes, and only had ones labelled Caribbean/Jamaican sweet potatoes. They have purple skin, white flesh, and are less sweet and a bit more fibrous. I had never tried these before, but I followed the recipe exactly, and it was fantastic! The were soft inside, sweet on the skin, and the dish was amazing! Definitely going I’m my vegetarian rotation!